This Chinese porcelain vase with its modern fencai enamel decoration stands 9" high and bears a red seal mark saying "Yi Xing Long Zhu" i.e. Made at the Yi Xing Long factory. Interestingly enough it also bears a poem that perhaps could be translated as " Beautiful woman at play and having fun, with her loving son within her brace" dated 1909. Failure of reform from the top and the fiasco of the Boxer Uprising convinced many Chinese that the only real solution lay in outright revolution, in sweeping away the old order and erecting a new one patterned preferably after the example of Japan. In 1905 Sun Yat-sen founded the Tongmeng Hui (United League). The republican revolution broke out on October 10, 1911 preceded by numerous uprisings and organized protests inside China. The first guns was fired in Nanchang, Jiangxi, where many of the fencai porcelain workers came from. A scenary like this could be something the artist missed most above all things at that time. The problem with a piece like this is that you never know if it is the poem or the porcelain that is dated. 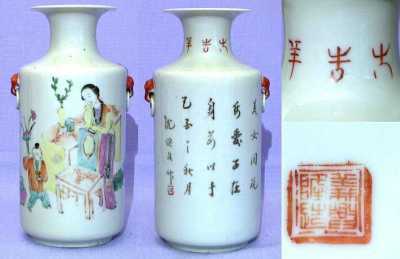 If we belive they are the same or not that far apart anyway, this would make this vase an extremely rare pieces dateable to the short Qing dynasty, Xuantong (1909-1912) period.